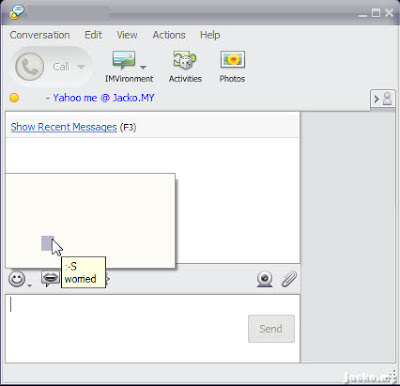 Jacko.MY: Bug In Yahoo! Messenger 9? While I am happy using YM on my machine and also on Jacko.MY, I guess there's a harm free bug on the latest YM on Vista, the version 9.0.0.2018. I removed my identity from this screen capture but I did not remove the emoticons. You can see clearly, in the chat window, supposedly the emoticons should be shown on the context menu when you click on the emoticon button, but it's empty. When you hover the cursor to the context menu, you can still see the balloon tip pops up to give a description and shortcut key of that particular emoticon. As shown above, the worried emoticon :-S. Click on it will send the keys :-S to the text box and you can click Send to send it out to your buddy. So, the emoticon feature is still functional just like usual, just that emoticons are not displayed on the context menu. I installed the same version onto another machine running Windows XP Pro SP3 and this problem did not appear. This XP machine has identical software configuration (i.e. same version of MS Office, .Net Framework 3.5 etc installed onto default directory) like my Vista Ultimate SP1 lappy, so it seems that the problem only happens to Vista machine. I have done some verifications to ensure the Emoticon is enabled in Preferences - Messages - Miscellaneous and also to ensure there are 179 emoticon files reside both in C:\Program Files\Yahoo!\Messenger\Media\Smileys and also C:\ProgramData\Yahoo!\Messenger\Media\Smileys, but the problem still ghosting me. I've logged a case with Yahoo! Support and was asked to install .Net Framework 3.5, MS Visual C++ 2008 Runtime, Java Runtime and also Direct X. I checked and noticed I have all these installed beforehand and no doubt the problem still persists. And if these runtimes are required to run YM9, why it's not listed as system requirements in the download page? Now I am pending their response after I sent them the result and asked if this is a bug, it may take a while for them to troubleshoot. While waiting the response, I don't have second Vista machine to reproduce the problem, if you are using YM9 on Vista, let me know if it happens to you. once installed, then rerun the web installer that you downloaded from yahoo site to update it to the latest version. make sure your internet connection is steady until the installation complete. hope this helps.